Frylight is the original 1cal cooking spray - a healthy alternative to cooking oil. For frying, baking, grilling and roasting. Gluten free. No artificial ingredients. Approved by the Vegan Society and the Vegetarian Society. 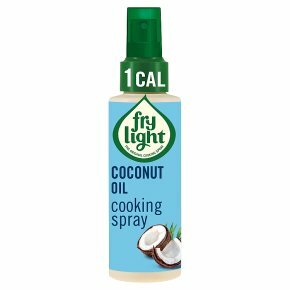 With natural coconut flavour, Frylight Coconut Oil is the perfect choice for stir fries, curries and much more. Infusing a beautiful Caribbean and Asian touch into your daily dishes - without the thick texture of coconut cooking oil. Allowing you to use 95% less fat than oil*, Frylight is the everyday, healthy cooking oil alternative. With each spray of Frylight containing just 1 calorie, this means you can save over 120 calories* when using it in place of your regular pouring oil. And with no artificial ingredients, it's the perfect choice. For recipes and tips on how to use your Frylight, see www.frylight.co.uk or search for Frylight on Facebook, Twitter or Instagram. *Using 5 sprays per cook (5kcal/0.5g fat), which can replace 1 tablespoonful of oil (120kcal/15g fat) or butter (110kcal/12g fat) = 95% less fat and saves over 100 calories per cook.